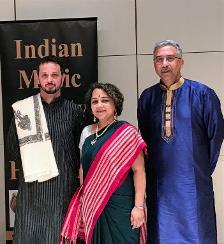 Ravi Albright is a professional tabla player and the Executive Director of Seattle Tabla Institute, a 501c3 non-profit organization, offering ongoing classes, workshops and musical events throughout the year in Seattle, WA. 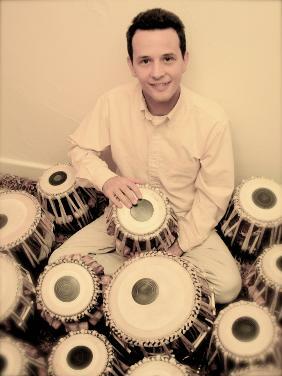 Ravi has also formerly served as Adjunct Professorship of Tabla at Lewis & Clark college in Portland, OR. Born in Seattle, Ravi has been a student of North Indian classical tabla drumming in both India and the U.S. since his youth. He is one of only a few ganda-banda ( formally recognized ) disciples of Pandit Anindo Chatterjee of Kolkata, India. In 2006 he was initiated into the Farukhabad Gharana, one of India's traditional schools of tabla playing. His status was consecrated at a formal ceremony call a "puja", in which the guru (revered instructor) ties a thread around the wrist of the shishya (student) to signify the bond between them and the commitment of the shishya to the art form. Ravi has dedicated his life to Tabla and will be a torch barer of this important school in the years to come. In his youth, he also studied with the talented Debopriyo Sarkar, a very advanced student of Pt. Chatterjee in San Rafael, CA. Ravi is now a professional tabla player based in the Seattle area. He performs regularly in the Seattle area for classical Hindustani, Western classical, and fusion ensembles. Ravi has studied accompaniment from and performed with many accomplished musicians such as Ustad Amjad Ali Khan, Ut. Shahid Parvez Khan, Pt. Tejendra Majumdar, Pt. Nayan Ghosh, Pt. Sugato Nag, Pt. Kushal Das, G.S. Sachdev, Deepak Ram, and many others. He has performed in the Seattle area, and throughout the United States and Canada.